How can a compression back wrap relieve my back pain? There are many causes of back pain and it is essential to seek medical evaluation for prolonged or severe back pain. When a back compression brace is advised by your doctor, the Adjustable Back Helix or SI Joint Helix are the best back support product available. Our back compression wrap allows uniform support to the paraspinal muscles, tendons and ligaments in the low back. Gentle support and comfortable compression frequently ease low back pain. For those suffering from associated muscle spasms due to arthritis, compression treatment may aid in reducing back pain. Back compression wraps can also be used to comfortably support injured abdominal muscles so that athletes can recover with less pain. Why should I use a back compression wrap? Back pain is a common nuisance experienced by men and women. If you suffer from discomfort or pain in your lower back from a muscular origin, you should will want to consider using a compression wrap. The Adjustable Back Helix is highly recommended for pain reduction due to its ability to keep your lower back muscles and tendons warm while providing gentle support to increase comfort. 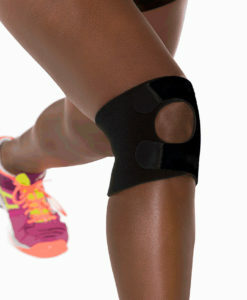 How do leg compression braces help to prevent injury to the knee, calf, ankle and thigh? Helix leg compression braces provide continuous support and medical-grade compression to help prevent and manage injuries resulting from repetitive motions, cold muscles and muscle oscillation. The Knee Helix knee sleeve applies uniform compression to bring comfort to the knee and its collateral ligaments as well as to relieve minor injuries to the anterior and posterior knee, meniscus and patella. 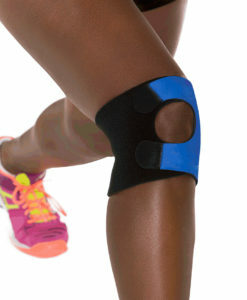 Our Body Helix knee support braces have also been shown to soothe arthritis pain. 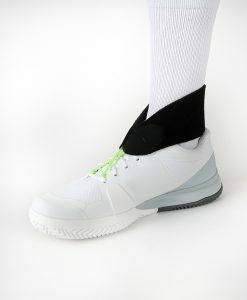 Designed to fit easily inside of a shoe, the Ankle Support Helix and X-Fit Ankle Helix ankle wraps help to alleviate the symptoms of both acute and chronic ankle injuries while providing comfortable support for the Achilles tendon, ligaments and arch of the foot. 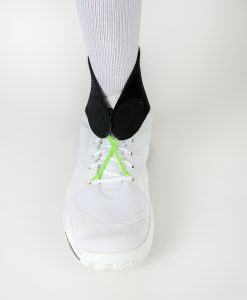 The Calf Helix calf compression wrap is designed to treat and prevent shin splints while also furnishing the muscles and tendons of the calf and lower leg with uniform support during physical activity. Lastly, the Thigh Helix thigh sleeve helps to minimize the risk of injury in sports by limiting the vibration and oscillation of a number of related muscle groups. When should I use leg compression wraps to help alleviate and prevent leg injuries? The Body Helix line of compression gear--including our knee sleeve, ankle wrap, thigh support brace and calf compression wrap--are all designed to be worn both during strenuous activity to help prevent injuries and in between training sessions to provide ongoing relief. The Body Helix leg compression wraps are designed to reduce the risk of injury by impeding muscle fatigue and reducing muscle oscillation during activity. Because all of our Body Helix compression garments use our state-of-the art compression fabric, which is designed to stay in place no matter how much you sweat, our compression wraps are more comfortable to wear during physical activity as compared with traditional bandage and slings that bunch and slip during exercise. For relief of existing injuries, Body Helix compression wraps can be worn while at rest to provide continuous and uniform compression for injury recovery. Can you still benefit from compression products if you’re not injured? Yes. Since compression wraps and sleeves increase blood flow in the parts of the body in which they are worn, they are perfect for preventative care as well as pain alleviation. Increased blood flow is also beneficial because it delays the onset of muscle and enables your body to recover more quickly after physical activities or training. 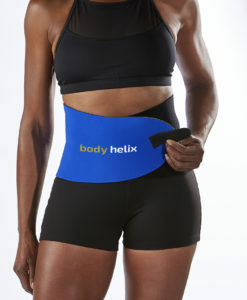 Additionally, compression products, like those by Body Helix, are beneficial because they provide support and warmth prior to, during and after physical activities.